The cloud is one of the biggest IT revolutions of the last decade, and it looks like its popularity is only increasing. At a 19 percent compound annual growth, cloud computing is by far the fastest growing segment of IT, expanding at almost six times the rate of overall IT. Spending on cloud services is expected to reach £162 billion by 2019. 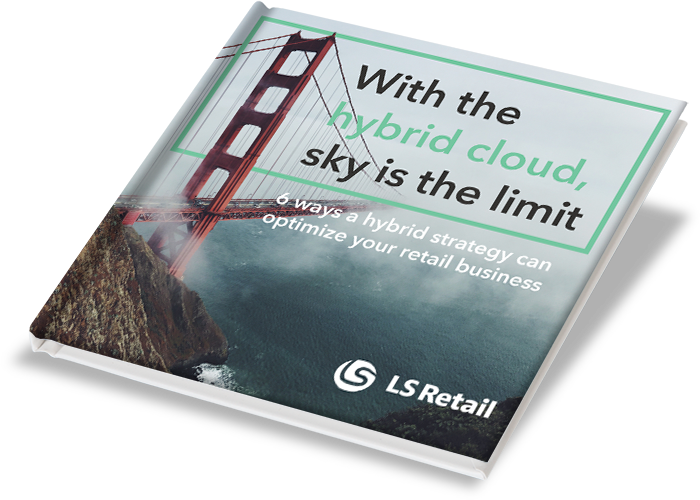 Although the cloud offers many opportunities to retailers, it can be hard to follow the industry’s developments if you are not familiar with the vocabulary. What is the difference between SaaS and IaaS? What is a hybrid cloud anyway? Wonder no more: here are some of the most important terms used in the industry. The delivery of services - storage and access of data and programs, network, analytics and more - over the internet, on demand. The cloud enables data centers to operate like the internet, with computing resources being accessed and shared in a secure and scalable manner. A company that provides cloud-based infrastructure, platforms, business applications or storage services to other organizations or individuals. A distributed IT architecture in which data is processed at the edge of the network, near the source of the data. Edge computing is a method of optimizing cloud computing systems. A service that delivers virtualized computer infrastructure over the internet. The main uses of IaaS include the development and deployment of PaaS, SaaS, and web-scale applications. Microsoft’s store for applications that are built on top of Microsoft’s cloud-based solutions (including, but not limited to, Office 365, Dynamics 365 and Power BI). The apps are built either by Microsoft or by Microsoft’s partners. Microsoft’s public cloud computing platform, and one of the leading public clouds in the world. Azure provides a range of cloud services to build, test, deploy and manage applications. Azure supports both cloud-only and hybrid cloud deployments. Microsoft’s cloud-based management system combining ERP, CRM, Office, and other apps into one user experience on a common data model. Designed to boost productivity, Dynamics 365 is available in two versions, Business Edition, for small to medium businesses, and Enterprise Edition, for large businesses. A cloud-based computing environment that provides developers with a platform on which software can be developed and deployed. PaaS recreates the traditional infrastructure components in the cloud, allowing developers to engineer applications on a pay-as-you-go basis. A payment model often used for SaaS services that lets customers pay a fee to use the service for a specific time period. Also called pay-per-use or subscription-based pricing model. A cloud computing platform dedicated to a single company for private use. Private clouds can either be built within a company’s own data center, or located off premises and owned and provided by a third-party organization. All management, maintenance and updating of data centers is the responsibility of the company that owns the cloud. Public clouds are computer services owned and provided by external third parties over a public network such as the internet. The service provider usually makes resources, such as applications and storage, available to the general public for free or under a pay-per-use model. The leading public clouds are Amazon Web Services, Microsoft Azure, IBM Cloud and Google Cloud Platform. A way of delivering services on demand. The software is usually hosted on the provider’s servers, and accessed by users through web clients. The provider takes care of maintaining the application and managing its security, performance and availability. SaaS applications are usually delivered through a pay-as-you-go model. Research firm IHL Group predicts that retail and hospitality SaaS revenue will grow 389% globally in the next 3 years. Dependency on a particular cloud vendor, and inability to move to another vendor due to lack of standardized protocols, APIs, data structures (schema), and service models. Vendor lock-in is one of the biggest obstacles to the adoption of cloud computing at the moment. Are you still confused about the cloud? Are you eager to try some of the innovation happening in the cloud, but don’t know where to start? Then contact our experts and get an answer to all your questions.